Two or three months ago I got drunk, at work, on a Sunday evening. Afterwards, cycling home at an overconfident speed, I turned onto Rue Sainte Catherine, misjudged a gap between bollards and ploughed into one, taking the impact on my shin and pedal. I fell face-first landing flat on the pavement. You’d expect nothing less of someone who writes about drinking and cycling, right? The cut in my leg was deep. I thought my bike had got lucky and come away without even a scratch. But last week, the pedal came off. I tried simply screwing it back in but the thread had completely worn away and it was then that I noticed the big gash on the crank. I needed to find a mender, a tinker, a master… by chance my flatmate Adrien knew just the man for the job: le dernier vrai réparateur de vélos à Bordeaux. Son prénom c’est Hervé. I was told he was a true character. The real deal. A pearl. The last of an old breed. In years gone by there were many like him, expert enthusiasts with a knowledge earned from hands-on practice. Working out of their garages. 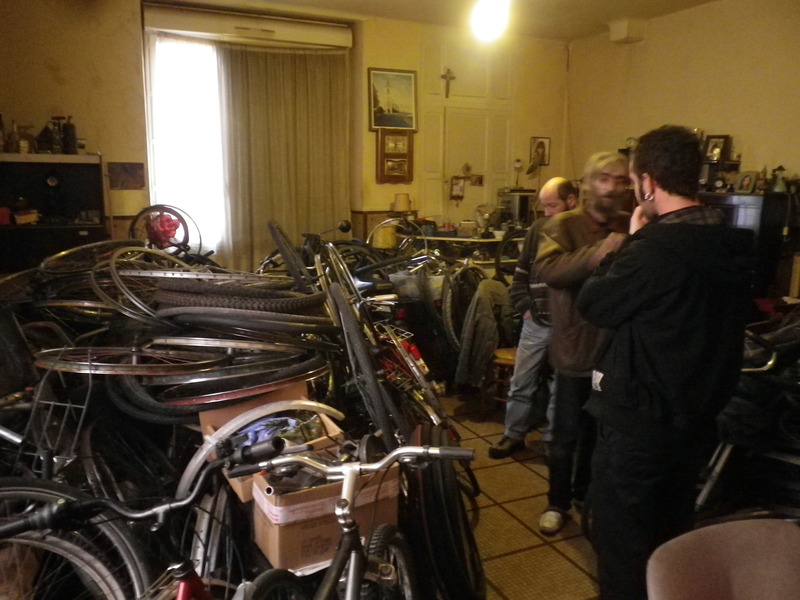 I was told Hervé didn’t have a garage, his living room was his workshop. He could fix anything bike related. 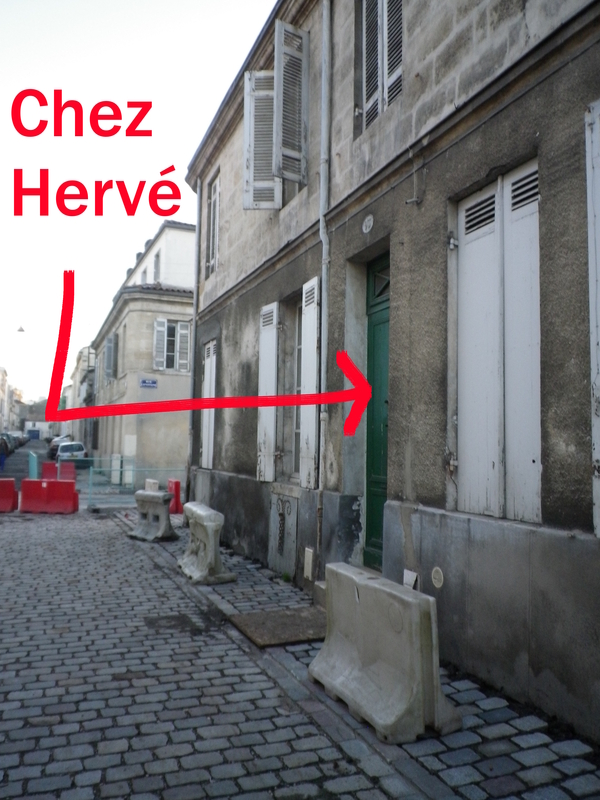 His wife was exhausted, exasperated, defeated by the amount of space and time that Hervé’s profitable hobby occupied. 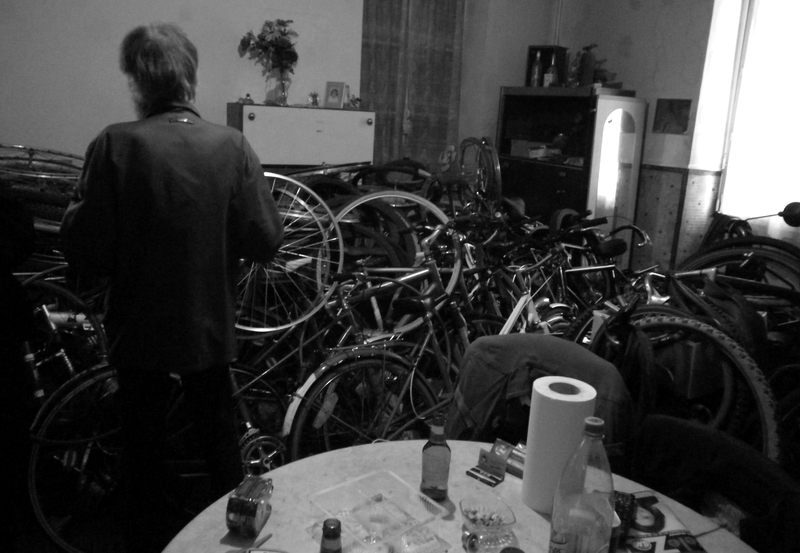 His friends would sit quietly, clean parts and slowly drink bottles of Kronenbourg. His sons would play video games. I was told they lived surrounded by piles of parts – penned in. 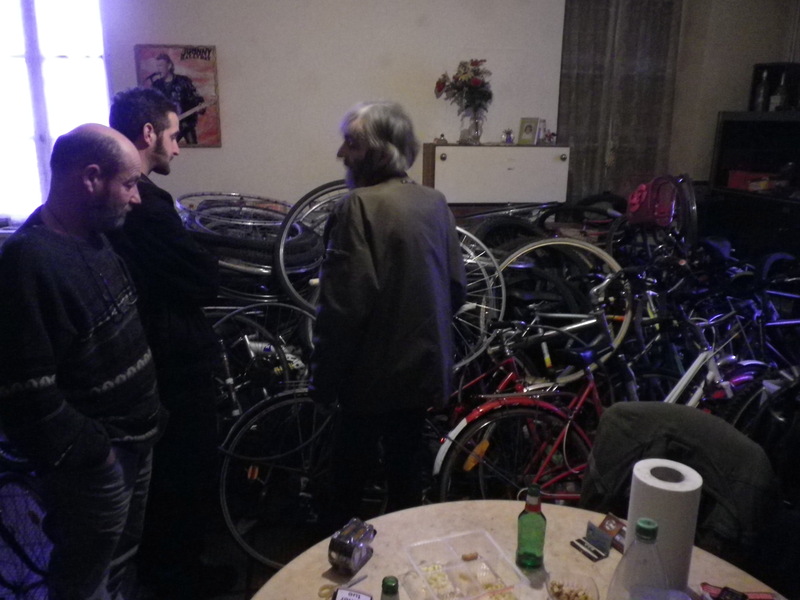 The bikes forming a kind of adaptable temple with Johnny Hallyday posters covering the walls. 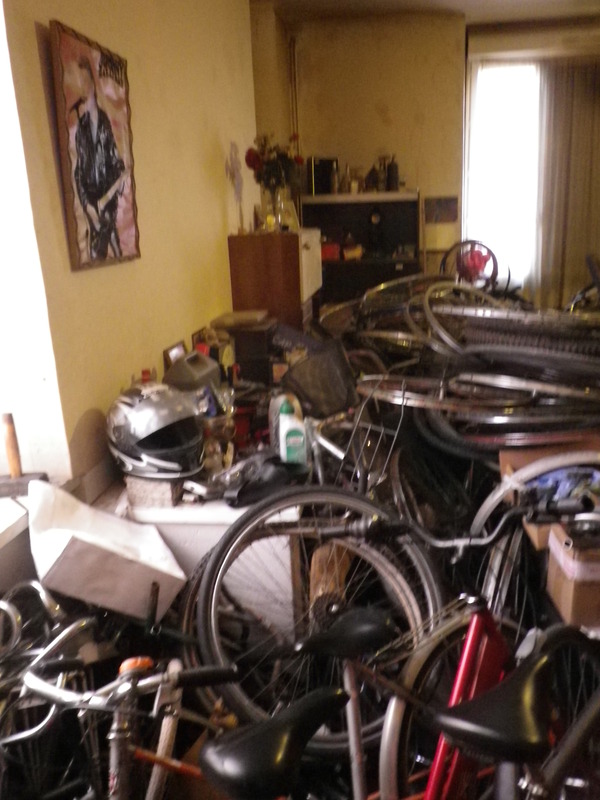 His cellar was also used for storage: an Aladdin’s cave of bicycles. I was sure that if the tales were true, then this man would be able to fix my bike — as sure as running water flows from the source. He lives on a normal residential street. There is no sign on his door. People get to know him by word-of-mouth, that is all, he doesn’t advertise, he doesn’t need to. I am told he is well-known, that is enough. He has been fixing bikes for 40 years. He is well-known. 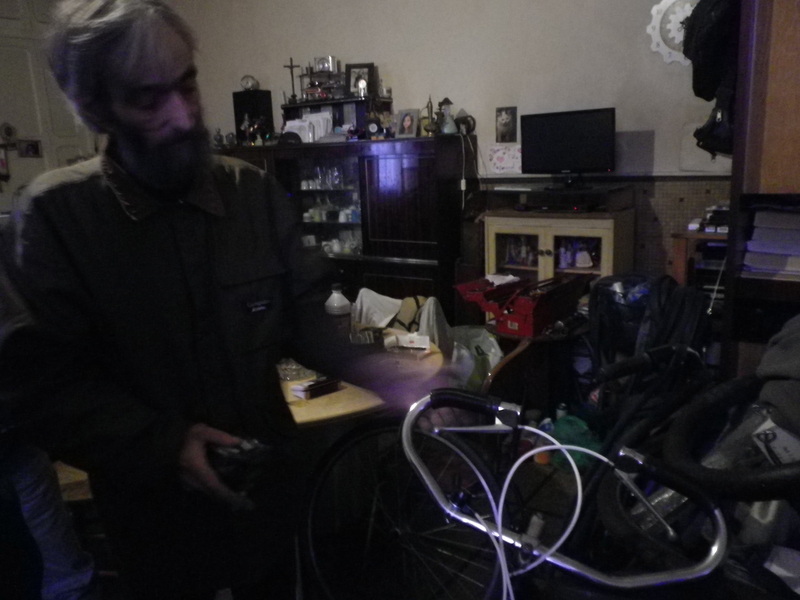 Adrien and I take him a sacrificial lamb: a bike that has reached the end of its life as a functioning mode of transport – all it is good for now is parts. We knock on the inconspicuous door. His wife answers. “It’s for a bike repair.” says Adrien. A familiar look bordering on love and despair comes over her. “He will be right with you.” she says as she turns and slowly walks back inside, leaving the door ajar. Out steps the man I was expecting. His appearance is just as I had imagined. 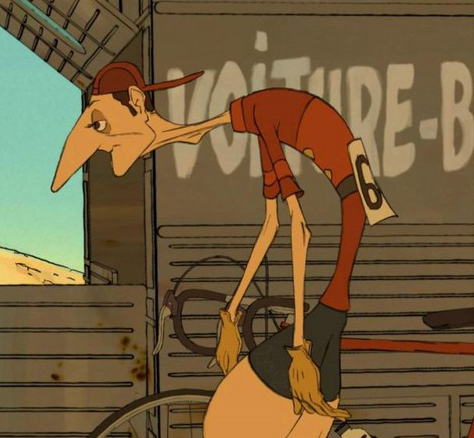 His gaunt visage, sallow eyes and prominent nose remind me of the grandson from the feature length animated movie Belleville Rendez-Vous. However Hervé is bearded, and what a beard! Each long silver hair is independent and as thick as the spoke from a bikes wheel. There are even a few hairs shooting out of the bridge of his nose. His black drainpipe jeans and flat white shoes with speedstripes scream rock and roll. His pale blue eyes are as calm as a Buddha. He lets us in after a few harsh words and a reminder that he has seen my flatmate three or four times, but me, never. His character has thus been imposed, and you are welcomed in, and the talking begins. 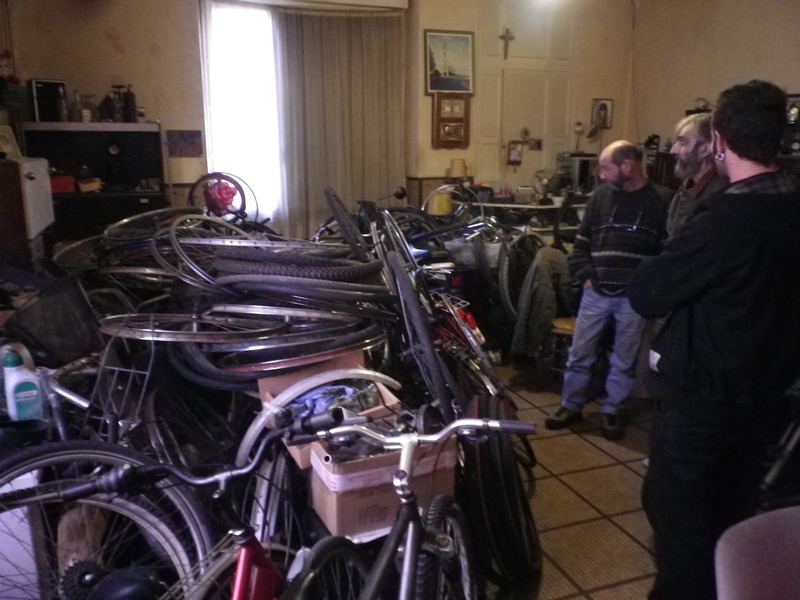 He talks about bikes, about the weather and the seasons when its good for fixing. How he’ll fix three bikes a day when the sun is out and people are on the roads. He shows you around. Lets you nose around. His fingertips black with grease, the half smoked cigarette in his mouth never really leaving but never getting lit. He moves and talks at the exact speed he wants to. To capture this on camera is incredibly hard. You can see in the photos above: Hervé is in the middle observing, discussing, moving. You can never really get a clear photo of the man because he has the same mythical quality as a Yeti or the Loch Ness Monster. Does he actually exist? Sat empty on the table is one of the plastic buffet boxes of corn snacks divided into four that you get in France. Also two Kronenbourgs. Exactly as I’d been told. His wife is sat at a PC playing some trashy game like Candy Crush Saga. His friend / assistant, who listens to the conversation from the sidelines, occasionally adds a grunt of agreement or nods and mummbles “Oui c’est ça.” in a low pitch. Hervé said he wouldn’t be able to repair my bike by the evening but that we should come back and pick it up sometime after the morning tomorrow. The next day Adrien fell asleep and it was raining, so I didn’t go. 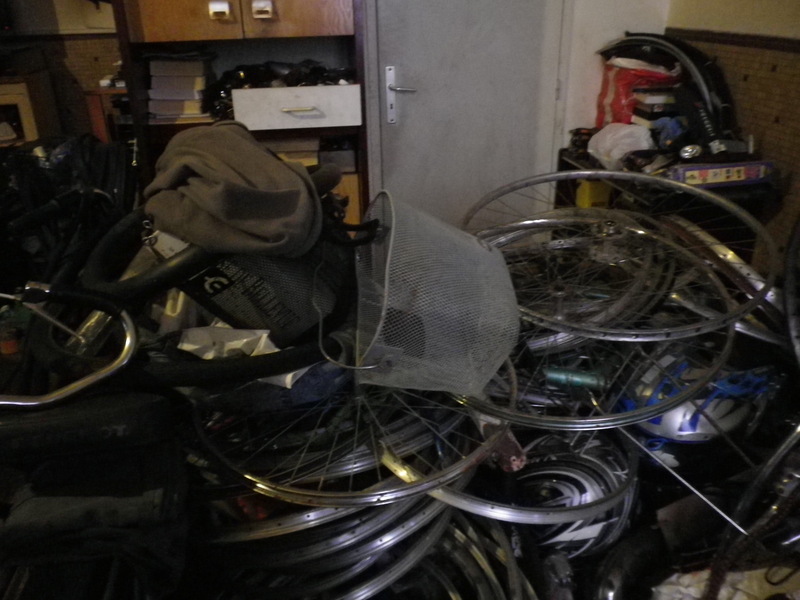 The day after I went along with my other flatmate, Olivier, who was in the market for a reasonable priced VTT. After a few knocks the wife opened the door with a charming smile on her face. It was fixed. It was a joli bike once again. Hervé had done a marvelous job. Hervé begins his chat by some harsh words again. It had been fixed for over a day. It would have been better for him if I’d come to pick it up before. 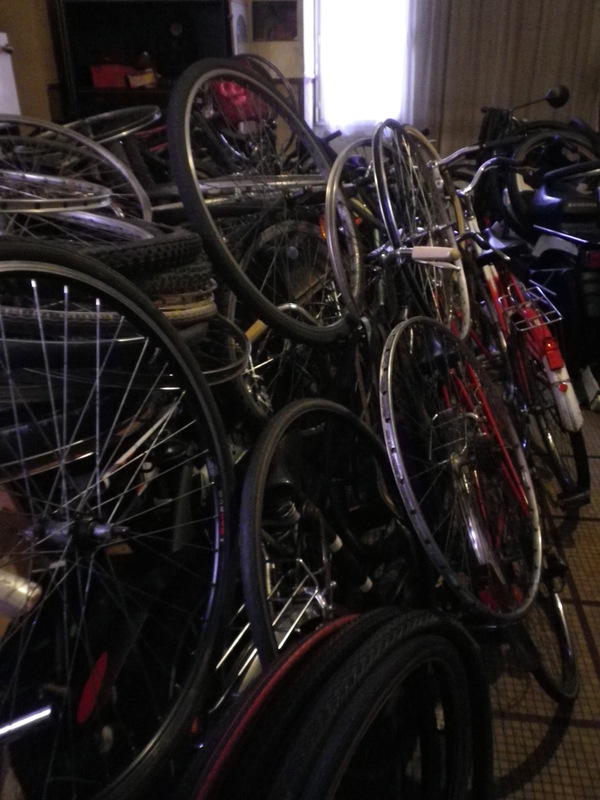 He couldn’t have people just leaving there bikes there for God-knows how long, they were beginning to encroach on the kitchen. Soon they’d be creeping upstairs. We look at my bike and Hervé remarks at how nice it is. I tell him how much I paid for it. His wife agrees profusely as we leave the kitchen. A really joli bike she says as she delicately caresses the saddle. I told her that I bought this bike off the internet and it had arrived in a cardboard box. She told me I should make sure I use a good lock. I know, I said. I know. Hervé was showing Olivier the bikes he had. He was wearing mostly the same clothes as two days ago but wore slippers instead of shoes today. The sacrificial bike we had take him had been flipped upside down and had already been partially dismantled. Eventually Hervé and Olivier settled on a Giant VTT that seemed to be what the sort of thing Olivier had been looking for. After a little test ride outside Hervé gave the price of 80 euros. Olivier haggled for 60. Hervé flat-out refused: the amount of hours he’d put into fixing it up, he’d no way let it go for less than 80 – plus as it stood it was in good working order, it might not be beautiful, but it rolled well and if anything was to go wrong, then he promised he’d fix it for free. A free service because, well, he knows it’s a trustworthy bike. Olivier says he will think about it. Hervé charges me 20 euros for the replacement of the crank, a very reasonable price. The new crank is a bit rusty but it definitely has flare. Hervé says it was the only piece he had left in his collection that fit. The last of its kind. He was a little sad to see it go in fact. Tags: bike, fix, master, mend, repair. Bookmark the permalink. I am in Bordeaux now and have been cyceling from Amsterdam. 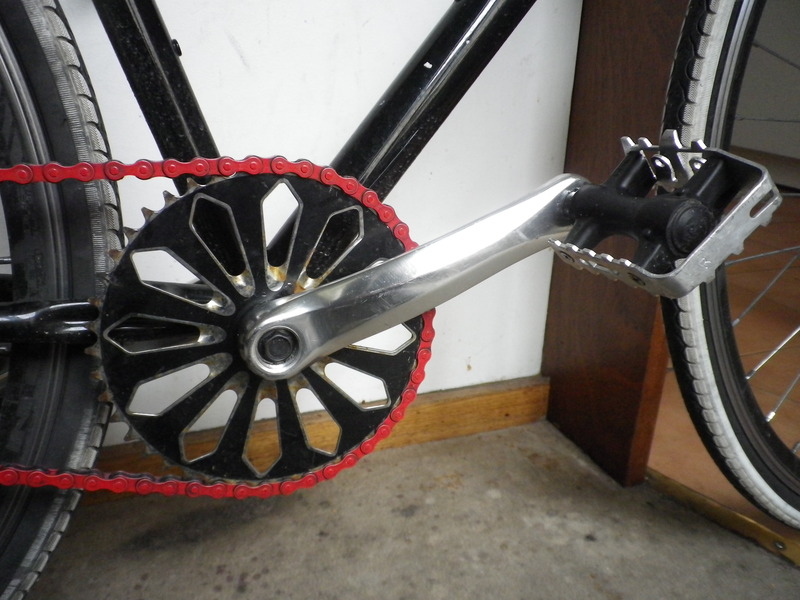 I have sometrouble withby vintage racer (rear derailur ) and was wonderingabout going to this guy. I am crossing the Pyrenees, so I need it to be solid. Does he speak any english at all ? 🙂 Hope for a seift reply.